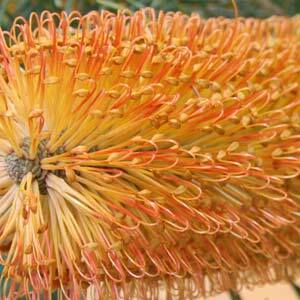 One of the loveliest of all of the Banksias is Banksia ericifolia or ‘Heath Banksia’. A native to coastal areas of NSW and Southern Queensland that will grow to around 6m in height, although a number of smaller growing forms are available. Banksia ericifolia is long flowering, with brilliant orange or deep red flowers, a white or cream form has also been identified. The large flowers are long lasting and excellent for attracting birds and bees to the garden. Florists and flower arrangers also love the strong structural shape of these flowering marvels. Like most banksia, Banksia ericifolia prefers a sunny position in a well drained soil. Be a little patient when starting out as Banksias in general do not have vigorous root systems and take a little while to settle in. New plants need some moisture, older plants are reasonably drought tolerant. It is worth cultivating the soil to loosen it up and water it well before planting, this encourages deeper root growth and stronger plants. A dwarf form B.ericifolia “Little Eric” will grow to around 2m. B. ericifolia nana ‘Bulli Baby’ is another dwarf form. B. ericifolia Orange Glow and the well known ‘Giant Candles’ (see picture right) are other cultivars. Pruning should be light and regular rather than hard pruning. Hard pruning can kill banksias fairly quickly, however many gardeners do not prune Banksia ericifolia at all, they just cut the flowers. This is a plant that does not form a lignotuber, so hard pruning is not successful. Soil – Well drained, slightly acidic. Height – To 6 metres in height, dwarf forms much smaller. Spread – To 3 metres depending on variety. Flowers – Large orange to red. Flowering time – From spring through summer into autumn. Foliage – Dense, mid to deep green.